What Is the Cypher System? Get the Cypher System Rulebook! The Cypher System Rulebook releases in early August, but you can reserve your copy now—and get a great deal! Download and print the retail pre-order form and fill it out your name and contact info. 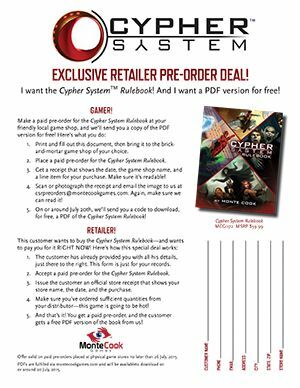 Go to your local game store and ask to place a paid pre-order for the Cypher System Rulebook. Give them the form. Pay for your pre-order and get a receipt. The receipt needs to show the date, the store name, and a line item for the pre-order. Shoot a photo of the receipt and email it to csrpreorders@montecookgames.com. Make sure the photo is legible! And that’s it! On or around July 20th, we’ll email you a code for a free download of the Cypher System Rulebook PDF!